Much like Saturday's slow-mo In-Port race, the 17:00 UTC start of the Volvo Ocean Race's 5,010-nautical mile sixth leg, from Itajaí, Brazil to Newport, Rhode Island took place in next to no wind, causing the six boats to drift frustratingly for nearly an hour before they finally reached the first mark. The Race Committee cut its losses and ruled that the fleet could sail straight out to sea after the first mark, dispensing with opening lap of the bay. 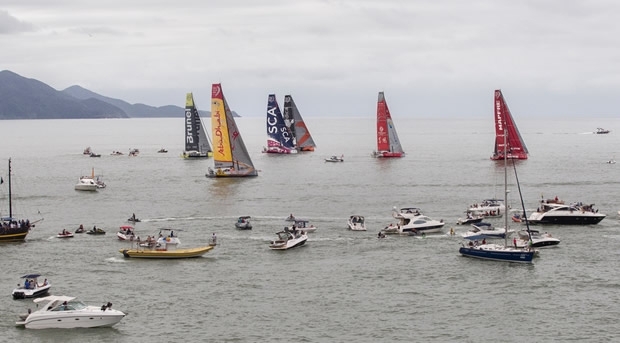 Over the course of the Itajaí stopover some 270,000 spectators visited the race village and nearly 50,000 more turned up from early in the morning for the departure of Leg 6. The warmth of the Santa Catarina locals was tangible, especially for the Spanish team MAPFRE, and their crew member André Fonseca, from Santa Catarina, and the only Brazilian sailor in the competition. Team Alvimedica is the team with arguably the biggest desire to win this leg whic concludes in their home port and they duly had the honour of leading the fleet out of Itajaí making barely three to five knots of boat speed. “It will be very exciting to see family and friends and hopefully the massive crowds of people that await us,” said Team Alvimedica skipper Charlie Enright. “The team is in a good place, we have been training in the right direction, and we’re poised to have a good leg. “I have been looking forward to this leg since the start. We feel really privileged to do this race and in addition it comes to Newport, which makes it really special or me. The maritime industry is a big part of the economy in Rhode Island and I know everyone is looking forward to our arrival. I think there will be big crowds on the water and on the land when we get there. It’s a real homecoming. MAPFRE was the Turkish-US team's closest pursuer, followed by overall race leader Abu Dhabi Ocean Racing, Team SCA, Dongfeng Race Team and Team Brunel. Walker and his crew, who head the leaderboard by seven points after Dongfeng failed to complete Leg 5 because of a broken mast, had a miserable start finding themselves on the wrong side of the starting line and in slow motion having to turn around to recross before setting off. The first 48 hours of the race are expected to be dominated by light winds. Xabi Fernández, back in the driving seat again aboard MAPFRE predicted: “Tonight we are going to have very little wind and will quite likely be sailing with the Code 0. Tomorrow morning we will probably change to the J1 and the boat will begin to go a little faster. In 24 or 30 hours we will have to make an important decision: whether to stay closer to shore or go out further to sea." The boats are expected to take around 17-20 days to reach Newport, the seventh port to host the race.